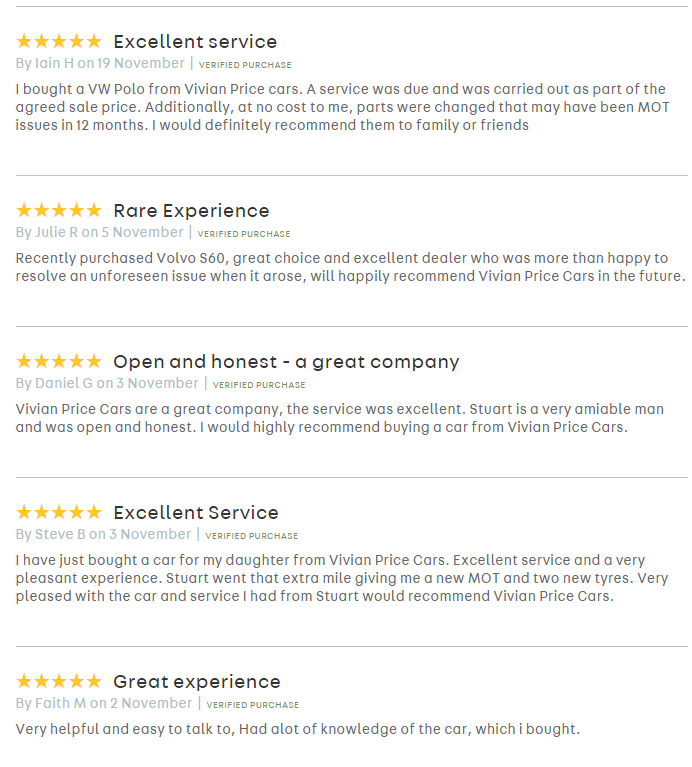 Vivian Price Cars is a trusted used car dealership selling a variety of vehicles to customers in South West England. You can see our full range on our Virtual Forecourt and arrange a test drive by clicking the cars you like and completing the on-page form. We specialise in buying and selling quality used cars that come HPI checked and serviced, with a 3-month extendable warranty as standard. When you buy a used car in Bristol, you have a lot of options to choose from. That’s why we go above and beyond to give our customers the best service possible and will strive to match you with the best car to fit your needs. Visit our AutoTrader page to read reviews from genuine customers and discover why we’re rated 5 stars for our products and customer care. Rated 5 Stars by AutoTrader Customers.